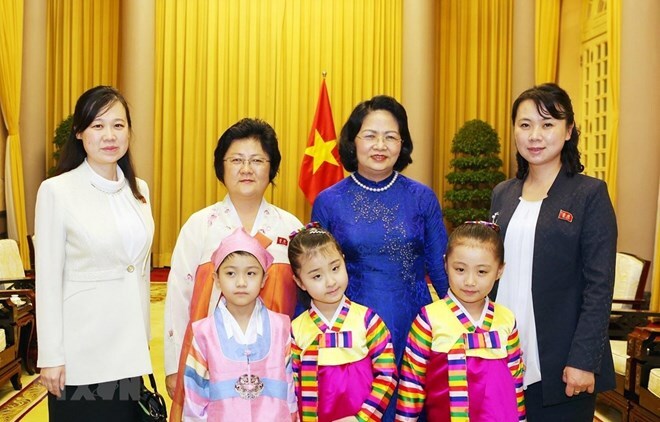 Hanoi (VNA) – Vice President Dang Thi Ngoc Thinh has affirmed that Vietnam always treasures its traditional friendship with the Democratic People’s Republic of Korea (DPRK), which was founded by Presidents Ho Chi Minh and Kim Il-sung. During a reception in Hanoi on March 26 for Vice Chairwoman of the DPRK-Vietnam Friendship Association Ri Cang-juk, Thinh expressed her belief that under the leadership of the Workers’ Party of Korea (WPK) led by Chairman Kim Jong-un, the DPRK people will reap new successes in the cause of socialism building and national development, thus improving their lives. The Vice President said the year 2019 is especially important to the two countries’ people, marked by an official friendly visit to Vietnam by Chairman Kim Jong-un in early March. This year will also lay the foundations for both nations to hold major activities in 2020, especially on the occasion of the 70th anniversary of diplomatic ties, she added. Thinh also asserted the Vietnamese Party, Government, and people’s support for the cause of socialism building and national reunification in the DPRK, as well as Vietnam’s consistent stance on supporting peace, stability, and denuclearisation on the Korean Peninsula.